The scouting meetings have been finished and the draft lists have been finalized. 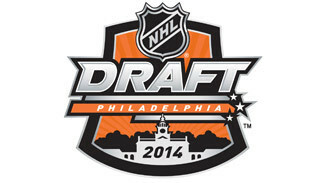 All that's left is for 30 teams to arrive in Philadelphia for the 2014 NHL Draft and begin picking players. That starts June 27 when the first round is held at Wells Fargo Center (7 p.m. ET; NBCSN, TSN). Rounds 2-7 will be conducted June 28 (10 a.m. ET, NHLN-US, NHLN-CA). NHL.com's draft experts have taken one last shot at predicting which teams will select which prospect. The list includes three centers ranked in the top four of North American skaters by NHL Central Scouting: Samuel Bennett of the Kingston Frontenacs, Sam Reinhart of the Kootenay Ice, and Leon Draisaitl of the Prince Albert Raiders. Then there's Aaron Ekblad of the Barrie Colts, who could be the first defenseman chosen with the No. 1 pick since the St. Louis Blues selected Erik Johnson with the first choice of the 2007 draft. NHL.com's three experts agree on the first five picks: Bennett, Ekblad, Reinhart, Draisaitl and Oshawa Generals left wing Michael Dal Colle. The order in which they will be selected varies. If teams are looking for a skilled forward, there's Jake Virtanen of the Calgary Hitmen, Nicholas Ritchie of the Peterborough Petes, Brendan Perlini of the Niagara IceDogs, Kasperi Kapanen of KalPa in Finland, and William Nylander of Sodertalje in Sweden's second division. If defense is what your team needs, there's Haydn Fleury of the Red Deer Rebels, Anthony DeAngelo of the Sarnia Sting, Julius Honka of the Swift Current Broncos, and Jack Dougherty of the United States National Team Development Program under-18 team. The Florida Panthers have the first pick, followed by the Buffalo Sabres, Edmonton Oilers, Calgary Flames and New York Islanders. The Stanley Cup champion Los Angeles Kings will pick 29th. The New Jersey Devils were assigned the 30th pick as part of an NHL decision to reduce the organization's punishment for circumventing the salary cap to sign Ilya Kovalchuk in 2010. The Anaheim Ducks and Tampa Bay Lightning are the only teams with multiple first-round picks. The Ducks have the No. 10 pick acquired from the Ottawa Senators as part of last summer's trade for Bobby Ryan, and the 24th pick. The Tampa Bay Lightning have the 19th pick and the 28th selection, acquired from the New York Rangers as part of the trade for Martin St. Louis. The Sabres could add a second first-round selection as a condition of their trade of goaltender Ryan Miller to the St. Louis Blues. If the Blues trade Miller, an impending unrestricted free agent, prior to using their first-round pick, No. 21, that pick would be transferred to the Sabres. That won't be known for sure until the draft starts Friday. Until then, check out NHL.com's predictions of how the first round could turn out.